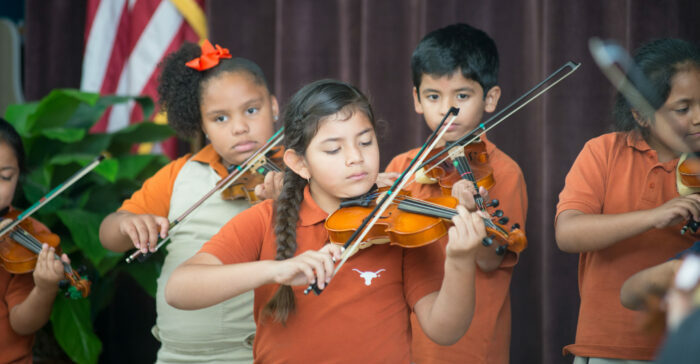 In addition to making sure that students excel in the core subject areas like language arts, social studies, math, and science, UT Elementary also focuses on teaching students specific skills like respect, empathy, and collaboration. We also teach philanthropy and service learning, sustainable gardening and healthy nutrition, the importance of living an active and healthy lifestyle, and multicultural fine arts. These additional skills make up the core competencies of our specialized programs. The Healthy Families Initiative has taken health and wellness beyond the walls of traditional Physical Education classes to a community wide approach to teaching health to its students and families. With a focus on gardening, cooking, and physical education, the Healthy Families Initiative is working to create an environment that not only promotes a healthy and active lifestyle, but provides opportunities for students and their families to actively explore the benefits of this way of life. The STEaM initiative is designed to development student knowledge and skills in the areas of science, technology, engineering, arts, and math. Students learn how to apply technology skills to solve problems and communicate with others. With a focus on project based learning, each year concludes with the completion of a showcase project. Prior projects have included a student-produced film, robotics competition, and a collection of student-produced digital stories.